Disclaimer: Made it with grass fed brisket, which was likely leaner then intended. The flavour and texture on this was pretty meh; it was ok, but not worth making again. We made the French Dip sandwiches with the left-overs, which were also largely meh. This turned out far better than anticipated. Potent and delicious flavor. Did not use as many pots and pans as many other Cooks Illustrated recipes. This is the recipe that makes owning a crockpot worthwhile. I often stretch the broth to 3 cups of each and extra red wine and it still turns out the perfect soup consistency. great easy stew, served it with rice. Super easy dinner! A very good, solid beef stew recipe. The Greek green olives were impossible for me to find. Turned out great anyway. Excellent recipe but recommend using a little more gelatine. After a night in the fridge they turned out OK but slumped a bit on the plates. Served with 2 coulis (next recipe in the book) - blackcurrant and white currant - poured in stripes over the panna cotta. Lovely! This is a fool proof, consistent make-ahead mousse recipe. Love it! This is so good! I love the graham cracker crust version as well, and really enjoyed it that way the first two times I made it. This week, I tried the Oreo cookies for the crust. I filled it with homemade Vanilla After-Dinner Mint Ice Cream from the Ben & Jerry's Homemade Ice Cream and Dessert Book (just add chopped Andes Mints to your vanilla ice cream base), and topped it with the Hot Fudge Sauce from ATK, and it was AMAZING!!!!!!!!! The mint and chocolate combination was heaven. No time to cook after work Want to stock your freezer with oven-ready meals Can't stand all the last minute work associated with entertaining The Best Make-Ahead Recipe will put you in control of all your cooking with recipes specifically engineered to the make-ahead approach. Sure, you can make your favorite dishes to heat later, but once food is refrigerated or frozen, flavor and texture suffer--pasta turns mushy, meat dries out, and almost everything tastes less than fresh. Built from the ground up, these make-ahead recipes are guaranteed to withstand storage and reheating without compromise. Make-ahead dishes like frozen lasagna and macaroni and cheese will come out of the oven just as saucy and cheesy as fresh-baked; stuffed chicken breasts will cook up juicy and tender even after two days in the fridge; and your make-ahead mashed potatoes will be so creamy and fresh-tasting your guests will think you've just mashed them over a hot stove. The test kitchen also provides precise instructions on scaling recipes up or down as well as detailed reheating instructions that won't leave you guessing. 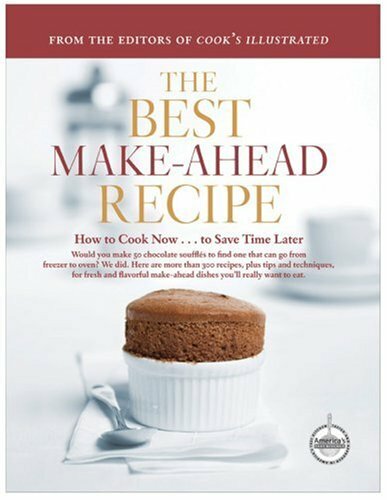 A lifesaver for busy families, The Best Make-Ahead Recipe will give you the recipes, tips, and techniques to plan and cook ahead--whether you are hosting a dinner party or want to put fresh-tasting food on the table every night of the week. Have you been tempted by the convenience of ready-to-cook breaded stuffed chicken breasts at the supermarket They might look good, but once cooked, the breading becomes soggy and the fillings taste bland. The Test Kitchen shows you how to pretoast bread crumbs for a guaranteed crunchy crust, and for the filling they rely on a highly seasoned mixture of cheeses and fresh herbs, whose flavors won't become muted. Most make-ahead coffeecakes are baked and then frozen, which can result in a dry texture. Here is a sturdy coffeecake batter (with an extra egg and additional butter) that can be either refrigerated or frozen right in the cake pan. When ready to serve, simply pop it into the oven, and in no time you'll get a fresh-baked coffeecake with a moist, tender crumb. Turn Sunday night's Braised Brisket into Monday night's quick and heartyToasted French Dip Sandwiches or an easy Meat Ragu. These double-duty recipes offer a variety of family-friendly weekend cooking options that will give you a headstart on organizing your weeknight meals. You'll never look at leftovers the same way again. The problem with slow-cooker stews is that by the time the meat becomes fork-tender, the vegetables have turned mushy and dull. For the Test Kitchen's beef stew, they found that wrapping the carrots and potatoes in a foil packet and placing the packet on top of the stew allows the vegetables to cook up just right and retain their bright, fresh flavor. When entertaining or cooking for the holidays, don't let last-minute side dishes slow you down (or stress you out). With these make-ahead menus, you can start your cooking up to a month in advance. With recipes, shopping lists, and a detailed timeline that coordinates all your cooking, you'll be able to get any holiday feast under control so that you can enjoy the day, too.